There is little public right-of-way in some areas of the Village of Midlothian, therefore several of the "public streetlights" are in place thanks to the cooperation of the property owner with Chesterfield County and the community. The streetlights in the Village of Midlothian are maintained by the property owners, typically in an agreement which was developed during the zoning process. 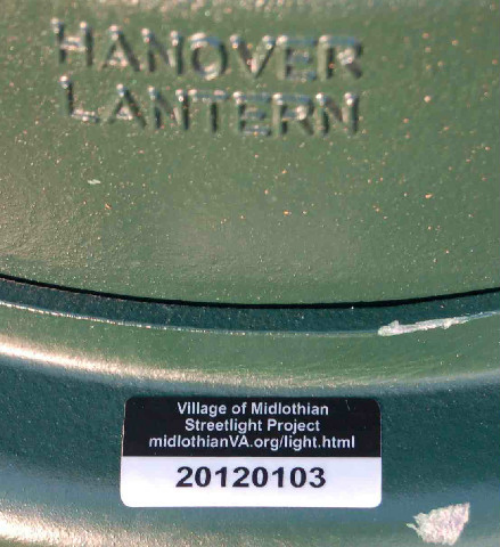 For reasons unexplained, several of the lights installed in the Village of Midlothian have often failed to follow the design guidelines set by the county. Not only are the poles different colors and shapes, but the lights vary in color and brightness, working against the "sense of community" the citizens who worked on the area plan sought to achieve. As detailed in the January 2012 audit's database, many of the light bulbs are not working. Some have been out for years. Each of the streetlights have been assigned a number that relates to the database.